Aunt Malai's Deep-Fried Lao Sausage Sandwich from Pal's Takeaway. Starting Tuesday, it will be slightly easier to get a sandwich from Pal’s Takeaway. Jeff Mason’s cult sandwich pop-up is going on eight years of hopping from venue to venue — a liquor store, bakery, and commercial kitchen among them — and has been homeless since its year-long stint at Forage Kitchen wound down in 2017. Now, the next phase begins. Pal’s Takeaway will pop-up at The Kebabery (4201 Market St., Oakland) for lunch every Tuesday from 11:30 a.m. to 4 p.m.
Mason’s sandwiches are widely beloved for their unique flavor combinations. 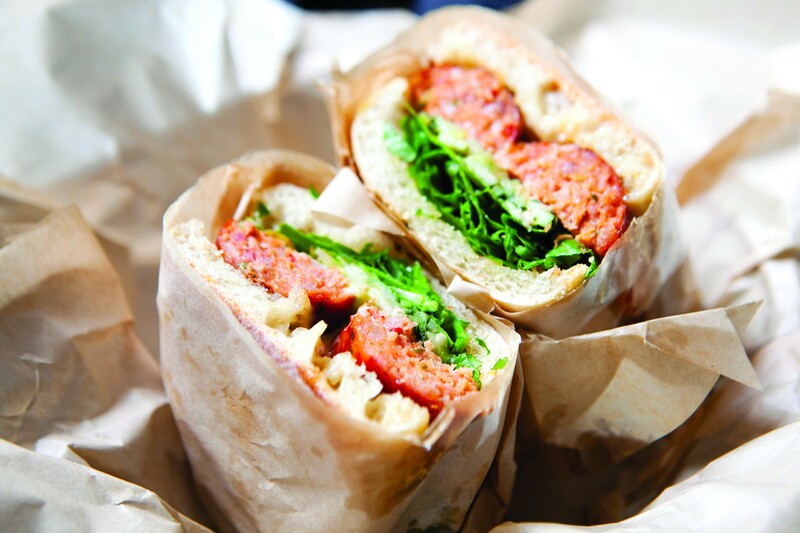 One of his most popular, for example, features sour Lao sausage with a cucumber-cilantro relish and yuzu mayo. Critics, including those from the Express and San Francisco Chronicle, have praised them, too. Related: Mason just launched his first crowdfunding campaign in an effort to finally find a permanent home.